He’s arguably the most improved sprinter of this season and Santa Ana Lane’s selection for the Inglis slot in the $13 million The Everest is testament to that view. Stable rep Sam Freedman is rapt his father Anthony will have two Everest runners in Santa Ana Lane and Shoals. (Pic: Grant Guy). The five-year-old, like stablemate Shoals a three-time Group 1 winner in 2017-18, is already back in trainer Anthony Freedman’s stable in the early stages of his build up towards Australia’s richest race at Royal Randwick on October 13. 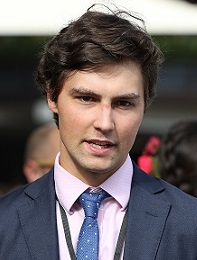 Sam Freedman, who oversaw Santa Ana Lane’s Stradbroke bid for his father, said the gelding’s selection is a big rap both for the horse and the stable to have two runners from a relatively small team. “We’re fortunate the slot holders have given our horses the opportunity,’’ Freedman said. Santa Ana Lane returned to his Mornington base on Tuesday and was announced as the Inglis runner on Thursday while Shoals, who was secured by The Star for The Everest, has been back in work a few days longer. Freedman said the path to The Everest for both horses is yet to be determined but it’s likely Shoals will resume in the Group 1 Moir Stakes at Moonee Valley and tackle the big race second or third-up. In Santa Ana Lane’s case, he’ll be stepping out at Randwick at his third run back – the same formula that took him to Group 1 wins in the Rupert Clarke Stakes and the Goodwood. “We’ll try to split them up but if we can’t it’s not a big deal because they are going to the same grand final,’’ he said. The rise of Santa Ana Lane has been remarkable, though he’s always promised to be a handy horse as he claimed the Group 3 Zeditave Stake at his fourth start. Freedman said the horse did spend a bit of time in the racing wilderness as he went winless for the next 14 months until he won the Wagga Town Plate under 61kg in May 2017. That win obviously did the trick because he’s contested five Group 1 races since for three wins, the latest in the Stradbroke Handicap (1350m) at Doomben on June 9. Santa Ana Lane on 🔥! @BMelham and @agfreedman combine for a massive #Stradbroke win at @DoombenRacing. “He lacked a bit of consistency but typical of the Lope De Vegas he’s come of age and developed into the final product,’’ Freedman said. “His win in the Wagga Town Plate, as much as it is a lesser race than what he’s won now, gave him plenty of confidence. “He was peppering the scoreboard without winning and he got that win and has gone to a new level since then. There was no turning point in his training it’s just the confidence and consistency. When asked what attribute Santa Ana Lane has that could win him The Everest, Freedman pointed to his ability to sprint off a fast tempo. “His last win he showed a bit more versatility but I think it’s the fact he can work through them and take the runs even though you need a bit of luck that way,’’ he said. Santa Ana Lane and Shoals are on the $15 line in TAB’s market for The Everest behind Trapeze Artist ($4.50).